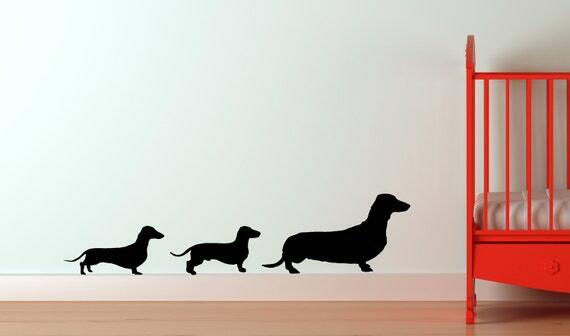 I recently spent some time browsing Etsy for different dachshund products. I found some adorable items for the baby that I had to have. I was sent some neat products to review and can't wait to introduce baby to my dachshunds once she is born! 1. CheekyandStylish Dachshund Soft Toy- Baby Girl Hernandez was sent this awesome handmade dachshund toy from the Cheeky and Stylish Etsy shop. She sells all different dachshund toys as well as quilts and rugs. I love the different colors and patterns that the stuffed animal comes in. I love yellow so I chose this yellow stars design. My dachshunds did not like this toy however since it was almost their size (I held it up to their bodies and they freaked out- haha!!). Baby will love it though! 2. byMMcc Onesies- Right when I found out that I was pregnant, I started researching everything dachshund. Any dachshund baby clothes that I can find, I want so badly. I found these adorable onesies from the byMMcc Etsy shop. There is the two dachshunds kissing onesie and the Love a Wiener onesie. I chose different sizes so that baby can wear dachshund clothes for awhile as she grows. These are so cute! They retail for $16. 3. Route3Studios- I was sent a few vinyl wall decals from Route3Studios to review. I was sent this awesome 3 set of dachshunds which will go on the wall of the baby's room. I chose them in white which will look nice against the pale green color of the nursery. I also received a decal with the baby's name on it which I am not revealing yet. The decal does look great through and I am excited to get it put up. I'm waiting to put them up until we get our furniture in there and all setup. The decals shipped quickly and the colors are customizable. The giveaway will be for a $35 gift certificate to Route3Studios Etsy shop to one reader!